Got Twins! If you've got twins, you've got to have this shirt! Make the announcement before people can ask the question, and find company with the other twin dads you'll meet. Available in black, navy blue, white or gray. Our got twins! shirt is a must for every mom of twins! You can answer the question before it's asked, and the shirt also helps explain things on those days where nothing seems to be easy - without you having to say a word! Available in black, navy, gray and white. The Grandfather of Twins shirt is sure to become grandpa's favorite shirt. After all, it is the ultimate t-shirt for grandpas of twins, and we all know how much Grandpa's love this sort of thing! 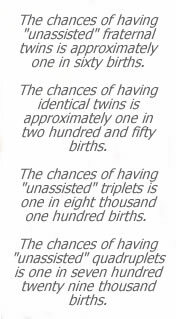 Grandmother of Twins are just about the proudest grandmas anywhere - and that's saying a lot! Our Grandmother of Twins captures this pride in a classy design loved by grandmas everywhere. Available in white or gray.